Honda's recall of 835,000 Pilot and Odyssey vehicles puts the company ahead of all other car makers in terms of recalls this year. Honda was second only to Toyota in vehicle recalls last year. 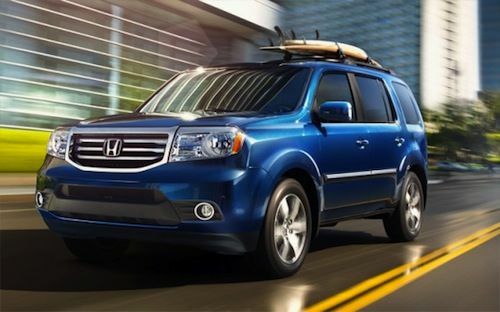 Picking up where it left off in 2012, Honda is ringing in the New Year with a massive recall. On Friday, the automaker recalled 835,000 2009-2013 Honda Pilot SUVs and 2011-13 Honda Odyssey minivans over faulty airbags. The recall covers 748,000 vehicles in the United States, 29,000 in Canada, 25,000 in Mexico and another 35,000 vehicles around the world. According to Honda, some airbags were built without some of the rivets that secure the airbag’s plastic cover. The missing rivets may cause improper airbag deployment, thus increasing the risk of injury in a crash. That being said, no crashes or injuries have been reported, said Honda. Honda spokesman Chris Martins stated that the defect was found during vehicle assembly when a worker noticed a missing rivet on an airbag. Honda will begin notifying customers of the recall next month. In the meantime, customers can contact Honda Customer Service at 1-800-999-1009 or online at www.recalls.honda.com. Concerned owners can also contact the National Highway Traffic Safety Administration at 1-888-327-4236 or at www.safercar.gov. No stranger to sizable recalls, Honda recalled 2.5 million vehicles in 2012, second only to Toyota. Both the Odyssey and Pilot were involved in multiple recalls last year including a December recall, which involved 870,000 vehicles. The recall affected 277,000 model-year 2003-2004 Honda Pilots and 347,000 Honda Odysseys, as well as 247,000 model-year 2003-2006 Acura MDX SUVs. Honda issued the hefty recall due to a vehicle roll away risk stemming from a problem with the vehicle’s ignition locking mechanism. The recall resulted from an October 2012 NHTSA investigation, which was launched after the agency received 43 complaints of vehicle roll away, 16 of which resulted in crashes. The automaker recalled another 820,000 vehicles in March due to a dangerous headlight defect. The recall, which concerned 820,000 Civic compact cars and Pilot SUVs, was issued due to a wiring problem. The recall affected 2002-2003 Civics and 2004-2005 Pilots. No injuries or crashes were reported, according to Honda. Honda issued a smaller, yet more eye catching recall in October 2012, involving 2002-2006 CR-V crossovers. According to the automaker, certain SUVs contained faulty driver-side power window switches, which may melt and cause a fire. The recall concerned 268,655 SUVs manufactured from February 19, 2002 through July 28, 2006. There were four fires reported in regard to the recall. In March, Honda recalled about 50,000 model-year 2012 Honda Civics because of a driveshaft problem. In particular, certain vehicles contained an improperly assembled driver's side driveshaft, which may cause CV joint separation. Such a problem may result in the vehicle being unable to move in any gear. Click here to read Torque News' report on Toyota's 2012 recall woes.